I had a grilled chicken salad. When walking out from the deli, there was the Waffle truck with the aroma of fresh made waffles drifting in the air.... very hard to just pass it by but I did. JM130ELM wrote: Meatball sub from Subway. I just had one for the first time 2 weeks ago, not bad! It's the only thing Subway has that competes with Quiznos IMO. I can't stand Quiznos. And they're way too expensive. They only thing they have that I like is the soup in bread. 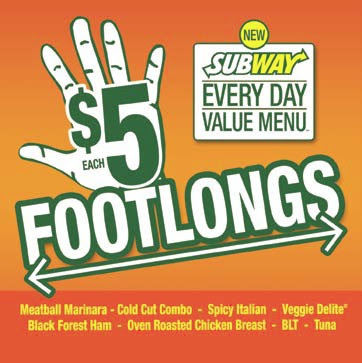 I'll take Subway all day. Having chicken fingers and a ceaser salad. Haven't had lunch yet but I'm thinking Checkers fries sounds good right about now. I had Taco Bell...and paid for it about two hours later. Two bagels with strawberry cream cheese. 2 slices of plain pizza. This tempted me. Subway meatball on Italian bread. Penne pasta with broccoli and grilled chicken. Im having a turkey burger with fries today. Think I'm gonna do Wendy's today. Left over stuffed pork chops from last nights dinner. I had a boring turkey sandwhich with some chips. i had a grill cheese sandwich and some red kool aid. About to run up the street to Quiznos. Long John Silvers for me. BLT with a Dr. Pepper. 3 egg whites on top of 3 pancakes with a can of Pepsi. Salami, provolone on a roll with mustard and a diet Dr. Pepper.